Summer is creeping up on us. For my family, that means all 4 of us are home for 3 months. Sounds fun right?! It is, if you can take the increased cost of living out of the equation. My water and electric bills sky rocket over the summer, we spend about 3 times more on gasoline in the summer. My grocery bill makes me want to cry. With my husband and son eating all 3 meals at home for 3 months it more than doubles every week. We haven't even got on the subject of entertaining the family, the sports and so on. This summer, I am going to reign in our spending. I am taking that depression inducing grocery bill on first. I have made it my mission to discover the recipes that taste amazing and are economical too. I am giving them a bonus star if they can be prepared without use of the oven. This has led me to start a little series over here called the $7 Dinner Series. I will be featuring recipes that you can make for your family for under $7 that will earn cheers instead of jeers for budget cooking! I love peanut chicken from the Chinese Restaraunt, but taking the family out for dinner every time I crave Peanut Chicken is definitely not budget friendly! Luckily, I came up with an incredibly easy and delicious alternative. Before you groan at the thought of eating peanut butter coated chicken, let me tell you, this is incredible. It is such a scrumptious combination. If you try it, you are going to like it. I promise! I purchased a 2.5 pound bag of store brand chicken tenders for $5.47 I used 1/2 of the bag for this recipe to feed 4 people. That made the cost of chicken for this recipe $2.74. I had peanut oil on hand. I used about 1/3 of a cup of peanut butter this would add about 45 cents to the price of dinner. Asparagus was on sale for 99 cents a pound. I used about 1/3 of a stick of butter which would add about 30 cents to the price of dinner. That brings this meal for 4 to $5.57. My husband says it is even better than take out, and seriously I couldn't go out for Peanut Chicken solo for $5.57! Place mushrooms in a frying pan with butter over medium heat. 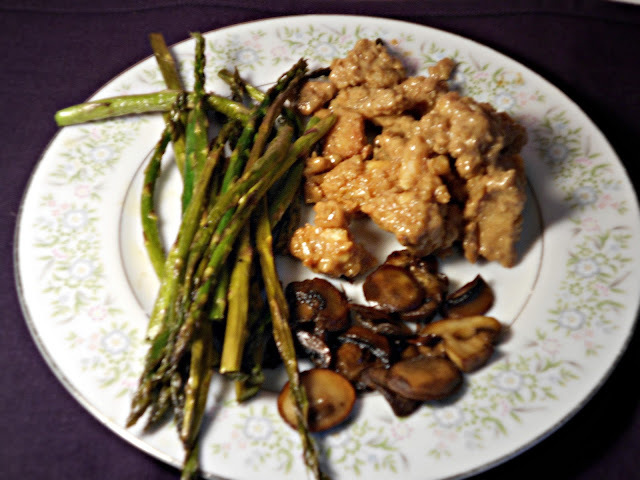 Allow to cook, stirring as needed until the mushrooms have a lovely golden brown color to them. Place your trimmed asparagus on a baking dish. Add butter to the top of the asparagus and sprinkle with salt and pepper if you wish. Place this in the oven to roast for about 15 minutes. As the chicken has fried and reached the recommended temperature of 165-170 degrees remove it from the pan or wok and cut it into smaller chunks. Discard oil remaining in wok/pan after it has cooled down a touch. Return chicken chunks to the pan/wok, turn to a medium heat setting. Add the peanut butter to the wok. Stir as it melts, make sure the chicken is coated. 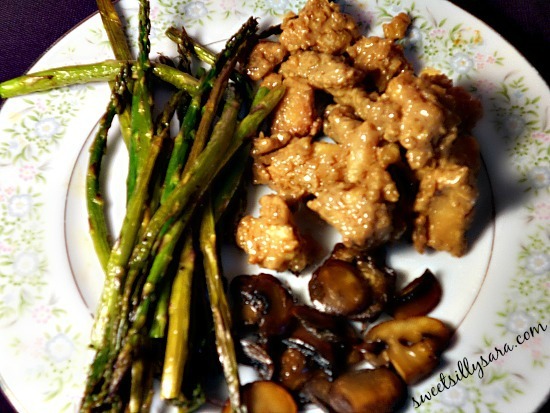 Remove mushrooms and asparagus from heat and serve with the Peanut Butter Chicken! This is such a great recipe. It is delicious, it cooks easily and quickly and it is economical. You really can't beat it! Do you have a favorite economical dinner that you often make for your family? I would love to hear about it! You might also enjoy this cute cupcake decorating idea! That sounds so wonderful! Peanut is one of my favorite flavors to pair with a protein source. I can't wait to give this a try. I love peanut butter on just about everything so I'm totally on board. I can't wait to try this! This sounds really interesting and now I'm quite hungry. I have never tried peanut butter chicken, although I have heard about it before. Looks like a delicious plate of food. I love this series because eating is rather expensive. I just my crock pot quite a bit in the summer. It's nice to have dinner done. Anyhow, your peanut butter chicken sounds interesting. I might have to try it. We love chicken. This sounds very interesting. I would have never thought to make peanut butter chicken before. I bet it tastes good though. This looks like a meal my kids would love. I will have to get the ingredients i need to make this on the weekend. This looks delicious! I've had grilled chicken with peanut sauce and it was absolutely fantastic. Now, I would want to try this recipe too, I'm pretty sure this is a winner.